Looking for a luxury mansion in the Mojave Desert, near Las Vegas? There’s a spectacular, contemporary mansion for sale at $12.5 million dollars. This contemporary mansion has five-bedrooms and nine-bathrooms but is not just another gaudy, luxury property. It’s eco-friendly as it produces up to 10 kilovolts of clean energy. The grander of this luxury home is immediate as you walk up to 13-foot-tall solid teak front door. The home features an angular facade of adobe, zinc panels and steel mesh. This gorgeous, luxury house is filled with an array of luxury amenities. 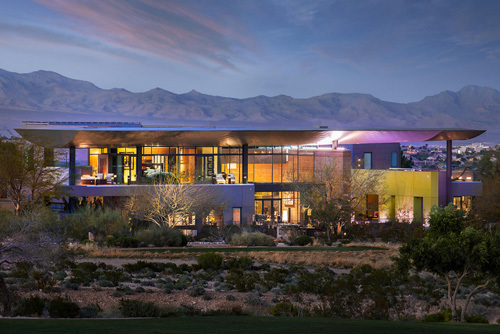 Offering an open layout that consist of three levels, the Mojave Desert contemporary mansion features floor to ceiling – high-clarity glass that delivers incredible views of the surrounding area. The property is just outside Red Rock Canyon in Nevada, and only about 17 miles from Las Vegas and everything Sin City has to offer. Red Rock Canyon is a National Conservation Area with about 200,000 acres of pristine Mojave Desert wilderness. This protected, natural area is beautiful. For fun, take an elevator down to the home’s lower level. It’s an ultimate playground for adults with a 13,255-square-foot bowling alley and lounge, chef’s utopia, billiards room plus a spa and swim retreat. Now that’s living in VIP style. The contemporary mansion also has a climate-controlled, glass-walled wine cellar that can hold 1,400 digitally cataloged bottles. Outdoor is just as spectacular. Bring your appetite and try the amazing wood-burning pizza oven. There are several fire features to enjoy peaceful evenings alone or hosting an over the top party. You’ll find cozy seating areas, in addition to a an infinity edge pool to beat the hot summer heat of Nevada. If you are in the market for a luxury home like this contemporary mansion near Las Vegas, Nevada – contact us today. The Life of Luxury works with the best luxury real estate professionals from around the world. Enjoy reading about the latest, luxury house industry news? Then follow this luxury blog to hear about other luxury properties. ← Live Your Life The Way You Want. How?